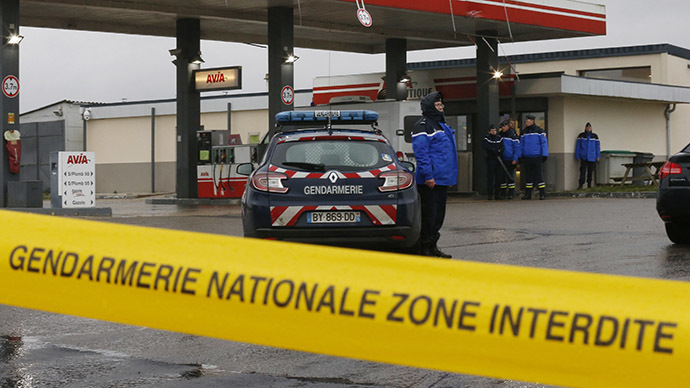 Two people suspected in the Charlie Hebdo shooting have been spotted 70km north of Paris. Police have extended their security threat level to a northern French region, where special forces are searching for the alleged assailants. Earlier there were reports that two people resembling the suspects had robbed a service station near Villers-Cotterets in the Aisne department in Picardy. The men allegedly fired shots and stole food and petrol. Paris has announced that its highest security alert level has been extended to the region of Picardy. There are reports that the men are holed up in the area. Officers from the elite BRI force have reportedly blocked the highway D17 at the crossing with N2 in direction of Longpont, a commune in Aisne north-east of Paris, Le Figaro reports. Following the possibility that the suspects have fled into the forest around Longport, several dozen police vehicles were dispatched to the area. Both regular officers and elite units are scouring the 13,000 hectare forest of Retz that borders the village, along with surrounding farm houses. A police helicopter could also be seen hovering overhead. Bruno Fortier, mayor of Crepy-en-Valois, 15 kilometers from Villers-Cotterets, said police helicopters are circling his town. "It's an incessant waltz of police cars and trucks," he told Reuters. The police reportedly found an abandoned Citroen C3, used by the attackers, near the Butte Chaumont park in Paris’ 19th district. Inside there were about ten Molotov cocktails and two jihadist flags, French media report. The sources, cited by AFP later, said the two suspects have been tracked down in the Picardy region of northern France traveling in a Renault Clio. They were armed and wearing hoods, Le Parisien reported. The suspects are brothers, Cherif and Said Kouachi. The third one, Hamyd Mourad, reportedly earlier handed himself in at a police station in Charleville Mezieres, after seeing his name on the list of suspects on social media. Earlier on Thursday, a man opened fire on a police officer and a city employee near La porte de Chatillon, Montrouge commune, south of Paris, police confirmed. The police officer later died in the attack. It remains unclear if the attacker, who was said to be of African origin, had any connection with Wednesday’s attack on the office of the French satirical weekly Charlie Hebdo. Later on Thursday, an armed man was sighted in Paris’ La Defense business district, according to reports. It is unknown if he is the same individual suspected in the La porte de Chatillon attack. Employees at La Defense, Europe's largest purpose-built business district, had been told not to leave their offices following reports of the gunman. Helicopters have since been reported to be hovering in the area. French Interior Minister Bernard Cazeneuve told reporters before the female officer's death was confirmed that authorities were doing their best to identify the attacker. He further cautioned against rushing to judgement, AP reports. The attack at the satirical Charlie Hebdo newspaper in Paris, which happened on Wednesday in the French capital, killed 10 journalists and two policemen. Eleven more people were wounded in the assault. Tensions are running high across France following the worst terror attack to strike France in a generation. Several Muslim places of worship have subsequently been targeted. Following reports of an attack on a kebab shop in the Eastern French town of Villefranche on Thursday, four training grenades were thrown into the courtyard of a mosque in the French city of Le Mans. One of the grenades exploded, but no injuries were reported. A gunshot was also reported overnight, with the bullet hitting the mosque. France is home to Europe’s largest Muslim population, with nearly five million people practicing Islam out of a population of roughly 65 million. President Francois Hollande has called for national unity following the tragedy. Thousands of people across the world have rallied against the shooting, which is believed to have been carried out in retaliation to the controversial cartoons by Charlie Hebdo. The weekly often satirizes religion, and particularly the Muslim Prophet Muhammad, in its illustrations.